Bulk Marbles → Decor Marbles - approx. 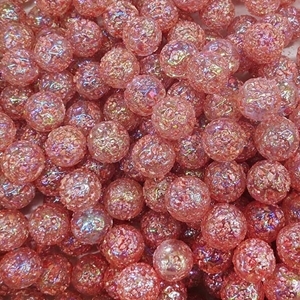 14mm or 9/16" → Fancy Varieties - 9/16" → Princess 9/16"
Princess marbles have a clear base with flecks of red covering the surface which are raised on the surface giving these marbles texture. They are iridized to have a highly shiny reflective surface. These marbles are 14- 15mm or 9/16" in diameter and sold in pound quantities, with approximately 100- 120 marbles in a pound. They are also available in a bag of approximately 250 count. Sizes may vary slightly. Warning! : Choking Hazard. This toy is a marble. Not recommended for children under 5 years.